They are supposed to be there for our safety. Guardrails can help prevent an out-of-control vehicle from careening over a cliff or other hazardous terrain and can also keep such vehicles away from opposing traffic. In these roles, they save lives. However, guardrail accidents can also be a serious danger and our Oakland highway crash attorney is closely following developing studies on balancing the role of guardrails as safety devices and the potential for guardrails to be roadside hazards. This week, ABC7 News reported that the Federal Highway Administration (FHA) is looking into the safety of guardrails after multiple reports of people losing limbs or dying in pain because a guardrail pierced their vehicle. The focal issue in the planned research study is whether the “guardrail heads,” the start/end piece of a rail, can absorb a head-on impact at up to 62mph in real life conditions. A team of public and private highway engineers as well as other subject-matter experts will conduct the FHA research. The FHA inquiry follows a study at the University of Alabama Birmingham, sponsored by the state of Missouri and the non-profit Safety Institute, which found a re-designed version of a commonly used terminal created a greater risk of serious injury and death than the original style. Sean Kane, president of the Safety Institute board of directors and a consultant on pending lawsuits involving the terminals, voiced “real concern about leaving [the new terminals] on the highways.” A summary of the study on the Institute’s website says the redesign is 1.36 times more likely to cause serious injury and 2.86 more likely to cause fatalities than its predecessor, although it emphasizes a need for further inquiry. Trinity Industries manufactures the re-designed terminals, called the ET-Plus. The company faces lawsuits by individuals who lost limbs in guardrail collisions and families of people killed in similar accidents. Trinity says the ET-Plus meets all safety standards. While the FHA agrees, it notes that even tested devices can lead to fatal crashes and emphasizes the need to examine real world performance. In the pending civil suits, victims suggest slight modifications to the original design, including reducing the size of one piece by an inch, turned the terminals into road hazards. Trinity denies the modifications had any impact on performance. ABC reporters say they found internal company emails stating the reduction saved it approximately $2 per terminal, but the company denies any profit motive in the re-design. A False Claims Act qui tam lawsuit has also been filed alleging Trinity defrauded the government by failing to provide notice of a manufacturing change. 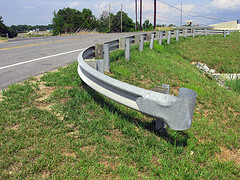 A cruel irony exists when a guardrail or other safety device endangers lives instead of saving them. We are closely following the pending litigation and the ongoing studies into the potential danger associated with the guardrail terminals. Civil litigation can compensate injured parties and grieving families while also serving as a wake-up call to those who may risk public safety in order to maximize profits. In some cases, government-related entities may also be at fault and fully representing the injured would require an understanding of sovereign immunity principles and the procedural rules applicable to such claims. Attorney Brod has the breadth of knowledge and experience needed to serve as personal injury and/or wrongful death counsel following guardrail terminal crashes or other safety device related accidents. He can also assist whistleblowers in government fraud suits based on the same underlying facts. Call any of our offices to schedule a consultation with Attorney Brod, an experienced Northern California lawyer for guardrail accidents in Oakland, San Francisco, Santa Rosa, or neighboring areas.